Just as small dogs live a lot longer than big ones, AC/DC seems to be benefiting from the compact size of its members, who probably average about 5 feet 4 inches in height and 110 pounds. 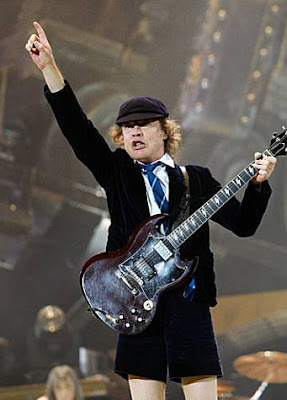 Lead guitarist Angus Young, in particular, is built kind of like Gollum from "The Lord of the Rings" - and we mean that in a good way. With maybe 6 percent body fat and no apparent end to his energy reserves, this guy is still going to be spry when he's an octogenarian. From a review of AC/DC's Oakland concert earlier this week.